Improve cardiovascular health and streamline Your exercise with the Sunny health and fitness motorized Treadmill. 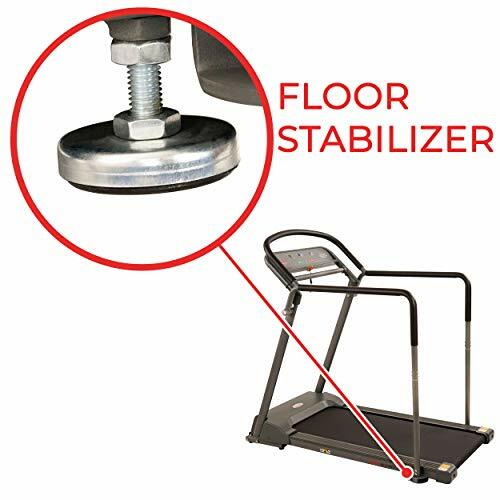 Mount and dismount comfortably on the Treadmill by using the low-profile deck. 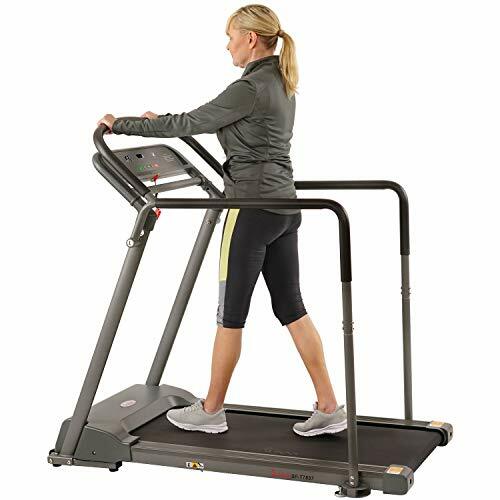 Reduce joint impact in every step with the shock Absorption technology that is embedded on the low deck Treadmill. 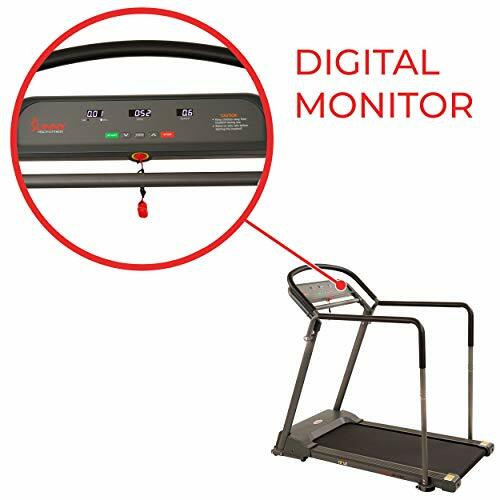 Easily keep track of workout data with the easy-to-use digital console that displays duration, speed, and calories burned. Use the console to help you reach your fitness goals. Utilize the mode button to aim for a specific time, distance, or number of calories burned during your workout. 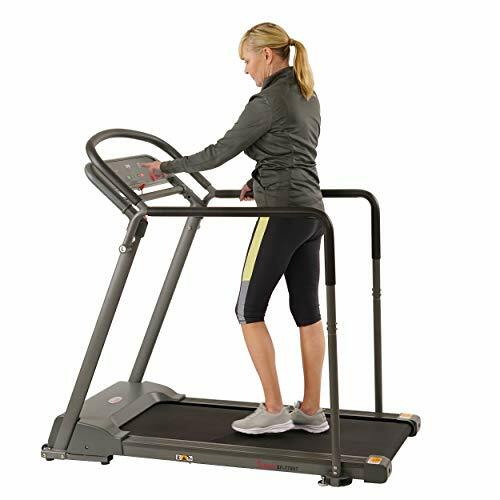 The lightweight Treadmill with handrails can accommodate up to 295lbs. Conveniently move This Treadmill in your home Using the transportation wheels. 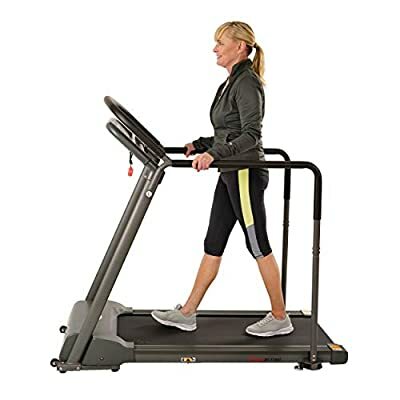 SHOCK ABSORPTION: low treadmill deck with 44L X 19.5W inch Running space. Supports up to 295lbs. Built in shock Absorption technology reduces impact on joints When walking or jogging. CAPABLE MOTOR: walk and jog between 0.6Mph and 5Mph by using the 2.5-Peak horsepower motor on the indoor treadmill. Make quick speed adjustments by using the speed buttons on the console. TRANSPORTATION WHEELS: This portable treadmill can be moved from room to room with its front-mounted transportation wheels. Its low-profile design makes the fitness equipment easy to store. USER-FRIENDLY CONSOLE: The simple design console tracks duration, distance, calories burned. Use the mode button to Personalize workout goals during each exercise session. 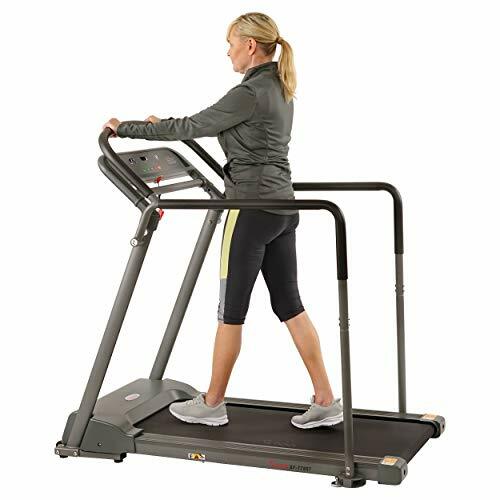 EXTENSIVE HANDRAILS: Use the multi-grip handrails along the top, middle, and sides of the low-deck treadmill for extra support. Maintain a comfortable grip with the thick and padded handlebars.